One of the key elements of any backup plan is to develop a media rotation scheme that protects your data. The best rotation schedule is one that provides you with a long, deep and varied history of file versions (as opposed to a Tape-A-Day scheme, for instance, that merely overwrites data from the day previous. To maintain a fully backed-up system, protecting your data at least once per day is essential. A full backup usually includes your entire system and all its files. Weekly, monthly and quarterly backups constitute a full backup. The first weekly backup should be a full backup, usually made on Friday or over the weekend, in which all desired files are copied, with subsequent Monday-through-Thursday backups. However, the cost or time required to do a full backup everyday can be impractical, especially for companies with vast amounts of data. Many users therefore will do either an incremental or differential backup most days. Differential backups back every file that has changed since the last full backup is backed up each time. It is faster to restore a differential backup. All you need is the last full and last differential backup. Differential backup is gaining in popularity because it traps files at points in time, for example, prior to virus corruption. Incremental backups back only the files that have changed since the last full or incremental backup are backed up. Subsequent incremental backups only back up those files that have changed since the previous incremental backup. On average, incremental backups take less time because there are fewer files backed up. However, it takes longer to restore data since data from the last full backup, plus data from all the incremental backups, must be restored. At least once per week a full backup should be performed. This will provide a recent record of all files, minimizing the number of tapes to search for a recent copy of a single file. Full backups also create a level of redundancy for most files, duplicating exactly any files that have changed during the week as well as duplicating any files that exist on the prior week’s full backup. Here, we outline two popular rotation schemes that are offered as configurable backup patterns by most backup application software. Both offer a great depth of file versions; choose the one that works for you, or customize to your own needs. Then, make sure to put it into place at all locations and across all types of data on every platform. The most commonly used media rotation schedule is “Grandfather-Father-Son.” This scheme uses daily (Son), weekly (Father), and monthly (Grandfather) backup sets. 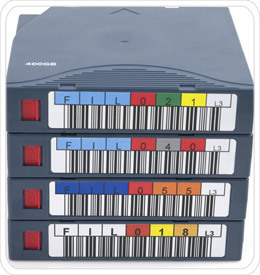 Four pieces of backup media (assumes one tape per back-up, more may be required if backing up larger quantities of data) are labelled for the day of the week each backs up; for example, Monday through Thursday. Typically, incremental backups are performed on the “Son” group of media. This media is reused each week on the day matching its label. A set of up to five weekly backup media is labelled “Week1,” “Week2,” and so on. Full backups are recorded weekly, on the day that a “Son” media is not used. This “Father” media is reused monthly. The final set of three media is labelled “Month1,” “Month2,” and so on, according to which month of the quarter they will be used. This “Grandfather” media records full backups on the last business day of each month and is reused quarterly. Each of these “media” may be a single tape or a set of tapes, depending on the amount of data to back up. A total of 12 media sets are required for this basic rotation scheme, allowing for a history of two to three months. Because a longer history is often required, archive tapes are periodically pulled from the rotation and replaced with new tapes. Tower of Hanoi got its name from an ancient Chinese game using recursive techniques. In the game, you move a stack of disks from one of the pegs to another peg and a smaller disk can only be placed on a larger disk. Like the game, many multiple media sets are rotated through in incremental and full backups. It uses more media sets than GFS for increased safety. In this schedule, one media set “A” is used every other backup session (daily sessions in this example). Start Day 1 with “A” and repeat every other backup (every other day). With each additional media set added to the rotation scheme, the backup history doubles. The frequently used media sets have the most recent copies of a file, while less frequently used media retain older versions. This schedule can be used in either a daily or weekly rotation scheme. The decision regarding the frequency of rotation should be based on the volume of data traffic. To maintain the required history of file versions, a minimum of five media sets should be used in the weekly rotation schedule, or eight for a daily rotation scheme. As with the Grandfather-Father-Son rotation scheme, tapes should be periodically removed from the rotation for archive purposes. Since media is reused, a media-retirement process and extra backup copies are recommended. Each of the media sets in the media rotation schemes discussed may be multiple tapes, depending upon the amount of data backed up. Since tapes are being reused, they should have a retirement plan. Plans include a time schedule, when soft-corrected errors exceed safe limits, or when they have been used a certain number of times. Software is available that monitors tape and media problems and alerts people in time for safe replacement. Also, archive tapes are periodically pulled from the rotation scheme and ‘retired’ to save and maintain a longer history for quarterly, yearly and other important information such as engineering drawings. Many experts suggest making two backup copies of the same data in case of a problem with one of the backups or pieces of media. Other experts suggest three backup copies with the third copy archived offsite for disaster recovery purposes. If your backup is bad — your data is lost. An old copy is better than no copy at all.